Searching for a home within the Vista Lakes Elementary School Zone? Then you are in the right place! We work hard to make your next home search easy and efficient, so that when you are ready to buy or sell, we are ready to help! 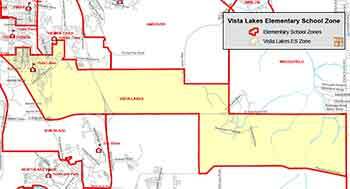 Students of Vista Lakes Elementary reside within the 32825 + 32829 and 32832 zip codes. Vista Lakes Elementary was established in August 2006 as a relief school for neighboring schools. Since 2006, Vista Lakes Elementary has become well respected in the community as a school that nurtures students academically, behaviorally and socially. Based upon the high academic achievement of our students each year, the Florida Department of Education has recognized Vista Lakes as an "A" school. As part of our commitment to excellence, teachers participate in ongoing staff development to further develop strategies and activities to meet the unique needs of all students. The Vista Lakes community supports the school through an active PTA and SAC, the COMPACT Mentoring Program, Partners in Education and ADDitions volunteers.